Two major functions of rubrics are: guiding and assessing. They guide students as to what is expected of them in a given activity or assignment and they also assist teachers in evaluating students performance along a pre-defined set of values, standards, and objectives. Rubrics can be used by “a teacher to assess a student, a student to assess a peer, or a student to self-assess their own work” (TeachersFirst). Two main types of rubrics are to be distinguished here: Holistic and Analytic rubrics. A holistic rubric is general in scope and uses a single scale where all assessment criteria are grouped into a single criteria used to assess the overall performance of students work.”Performance descriptions are written in paragraphs and usually in full sentences”. (Queens University). An analytic rubric addresses specific areas in students performance. It resembles a grid “with the criteria for a student product listed in the leftmost column and with levels of performance listed across the top row often using numbers and/or descriptive tags.” (Depaul). They help students make clear expectations of what a higher performance on particular performance tasks requires. 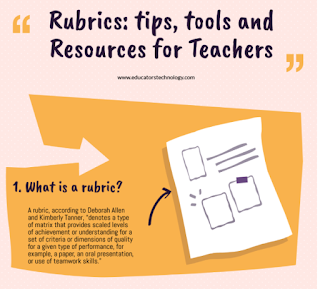 The sources list at the bottom of this post contains some useful links and resources to help you learn more about rubrics, how to use them, sample rubrics and many more. This is a simple and easy tool to help you make different rubric types. You can build your rubric from scratch and when you are done you can save, print and share with others. Quick Rubric provides you with some handy resources to help you learn more about the pedagogic strength of rubrics. Essay Tagger allows you to easily create Common Core-aligned rubrics. You can select the elements you want to include in your custom rubric. All along the way, Essay Tagger provides you with clear instructions on how to proceed in each stage in your rubric creation. Rubric Maker is another simple and easy to use tool to create rubrics. It does not require registration and is totally web based. 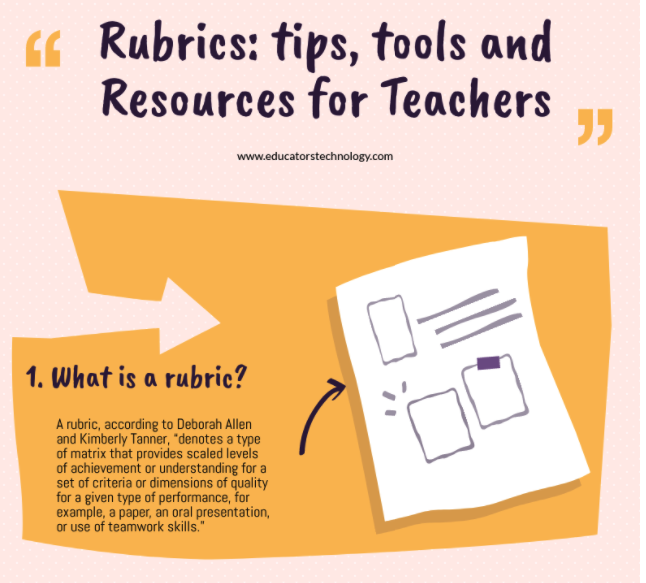 You can create and customize your rubric the way you want and when you are finished you can print and share it with others. It does not offer any option to save your finished product other than printing. This is one of the most popular rubric makers out there. It provides pre-made rubric templates based on different topics (e.g., math, writing, science, music, reading). The tool is free and can be used without registration, however, only registered members are allowed to save and edit their rubrics.